In more ways than one. 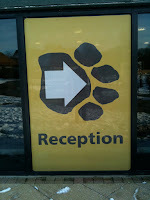 Today we had our briefing at the Dogs Trust centre in Uxbridge and it was a real eye opener. Firstly because it really brought home why I'm doing this, and secondly that there is no going back! The staff at the centre gave us a tour and introduced us to some of the animals currently in their care. Whilst they don't simply re-home dogs, this is a huge part of their work and it was heartbreaking to see evidence of the kind of abuse some dogs receive. 2 weeks ago a group of dogs were rescued from a woman in Ireland who had kept them all, at least 12 dogs, in crates for their entire lives. Most had never been outside. They arrived emaciated and some were not really able to walk, having never been allowed to. They were terrified and painfully thin, although she had obviously given them enough to just keep them alive. Within the 2 weeks at the centre they are all making good recoveries, some are even becoming confident enough to approach humans. They were being taken for short walks in the snow and were showing signs of appreciation, tails wagged. It's not a great photo as she was so happy to see us, but she is just gorgeous, and not unlike our little Willow, who is titchy and brindle. 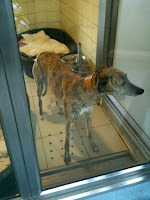 The guide explained that brindle dogs are the least likely to be re-homed, the statistics prove this, but no one knows why. I can't imagine why! Who wouldn't want a brindle misfit like this? 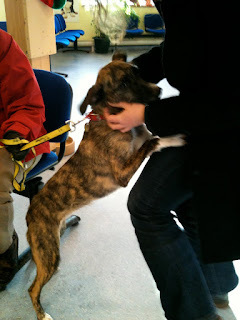 Most of the dogs waiting to find home are Staffies, Lurchers or Collies. The Labs and Springers go straight away, as do the little dogs, and puppies are popular, so the 'sticky' dogs are usually older crossbreeds with brindle coats, like Leggit here. Happy Christmas and thank you!! !